"OSAT companies need to further improve their margins, question their upstream strategies and become more downstream-oriented." The OSAT industry, which focuses on the Outsourcing of Assembly and Test (OSAT) processes, has been an attractive niche of the semiconductor industry for years, but it has not participated in the overall growth of the semiconductor market in equal proportion to other segments. 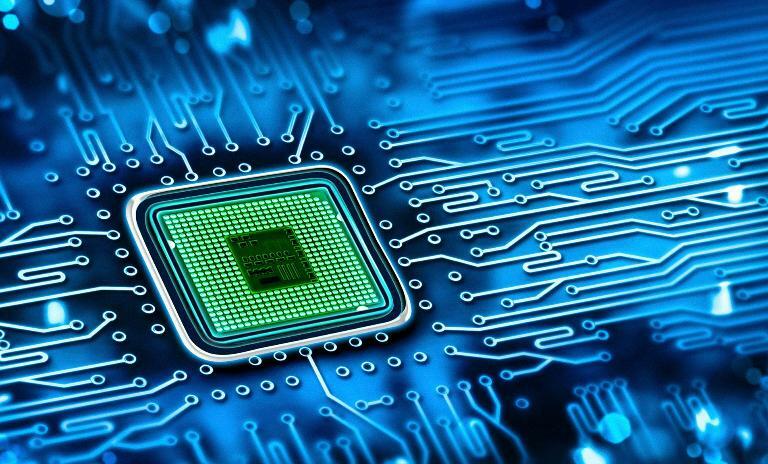 For instance, the OSAT industry grew by around 5 percent per year for the past five years, compared with 6 percent to 7 percent for the electronics assembly market, and more than 10 percent growth for the semiconductor industry during the same period. Based on a low-margin outsourcing business model, the OSAT industry got relegated to a niche, where it was left to search for margin improvements via better production technology and supply chain management. At the same time, many efforts to expand upstream didn’t bring sustainable value, and expansion downstream has also been difficult as deep-pocketed and powerful competitors moved into traditional OSAT territory. The OSAT industry also tried to increase the number and sophistication of its services by moving from a pure manufacturing service provider model to providing turnkey offerings, such as those that involve logistics and engineering support.Those efforts were of limited success, since many Integrated Device Manufacturers (IDMs) consider these activities part of their core competences. Furthermore, engineering service providers that manage the entire semiconductor supply chain for end customers frequently won out over OSAT players with those customers who wanted to make their own ASIC chips. All said, the OSAT industry is feeling major pressure from suppliers, new entrants, buyers and potential substitutes (e.g. the aggregation of individual testing steps into single testing steps or optimized testing processes). This is not to mention competitive rivalry from Chinese players. In other words, the OSAT industry is increasingly between a rock and a hard place (see figure 1), which has led to a wave of consolidation in the industry. But to improve their position and benefit more from the growth of the industry as a whole, OSAT companies need to do more than continue the consolidation. They need to further improve their margins, question their upstream strategies and become more downstream-oriented. Automation has become a bigger focus for the OSAT industry. To further improve their margins, OSAT companies can look to Industry 4.0. From machine automation to seamless IT integration with their customers and suppliers, Industry 4.0 technologies can significantly reduce the number of people in factories. The OSAT industry was one that was relatively people-intensive, which is a reason it flourished in Asia, where wages were historically low. Now, as wages in Asia are on the rise, automation is a bigger focus. By putting a priority on equipment automation, predictive main-tenance, and machine and line performance optimiza¬tion systems, the OSAT industry can achieve margin improvements. In addition, new technologies, such as co-bots may allow for the automation of previously non-automatable process steps. Extensive use of artificial intelligence in planning, production, and quality assurance will also increase productivity significantly. Second, we recommend companies take a critical look at upstream strategy and examine the value of further efforts in this area. As mentioned, efforts to expand upstream have faltered in the past. OSAT companies were early adopters of wafer-level packing technologies, including options for fan-in and fan-out redistribution. The intensity of rivalry in this area has increased over the past years since this technology enabled OSATs to foray into the territory of semiconductor foundries through wafer-level processing in the far back-end of the line. Yet OSATs quickly found out that their foray didn’t suit foundry companies, which proceeded to use their huge financing power, strong customer lock-in, and abundant legacy capacity to start wafer-level packaging. This led to price and margin declines for OSATs in the upstream business. Therefore, we believe OSAT companies should carefully review their upstream product and technology portfolios with an eye to current margins and margin potential. Moving into 3D technology offerings, and combining these offerings with wafer-level packaging, when suitable, is a way to bring margins back to a healthier level, making use of the upstream investment deployed. Finally, we recommend OSAT companies continue their efforts to go downstream, despite pushback. This can involve entry into specific niches of the electronics manufacturing services (EMS) market, doing so organically, by building an offering, or via partnership. For some OSAT companies, a viable option may be to serve as a main contractor and have a partner as a sub-contractor, in order to access new niches. To find the right model, it is important that OSAT companies deeply understand the value-add of their new offering. This is not always easy when entering a new market with a new set of customers. Current customers are typically makers of semiconductors, while new customers further downstream are likely to be makers of the sub-systems or end hardware – e.g. automotive Tier 1s or mobile phone makers. From a technology perspective, moving downstream is a natural next step for OSAT companies; but from a business perspective, it will mean attracting a whole different client base. The focus on downstream is critical, given the lack of options to expand upstream. In addition, the OSAT industry may be able to take advantage of fragmentation in downstream niches. In its current constellation, the OSAT industry is still seen as an appealing business, even if its growth rates are lower than the semiconductor industry as a whole. It is expected to grow by 5 percent per year until 2022, with growth as high as 10 percent in China. Looking forward, however, it will need to defend itself from further squeezing to maintain and increase growth rates. This is the scenario if macroeconomic conditions and growth levels in the semiconductor industry stay the same. If the market for semiconductors worsens, as some indicators suggest, it could see a down cycle of up to 15 percent and only a slow return to previous growth levels. In the fourth quarter of 2018 and the first quarter of 2019, company figures and falling stock prices indicated a “bear” scenario on the horizon for the semiconductor industry, which is experiencing overcapacity and is in the middle of U.S. trade tensions with China. 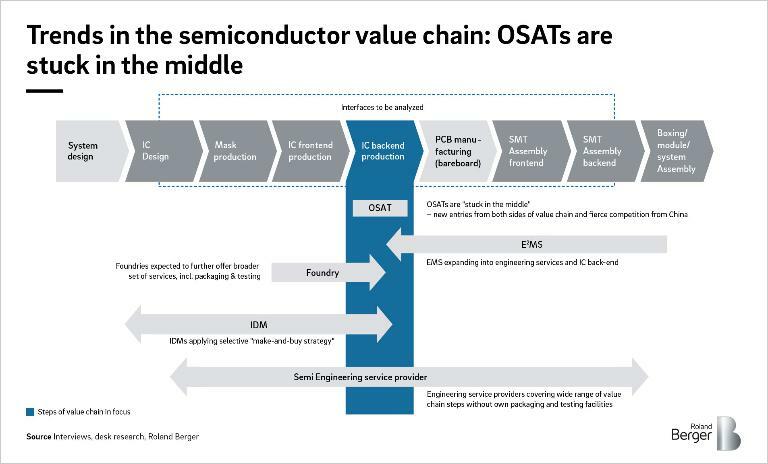 Under a bear scenario for the semiconductor industry, OSAT companies, already feeling pressure from suppliers, new entrants, buyers and potential substitutes, will experience even more competitive rivalry in the scramble for business.